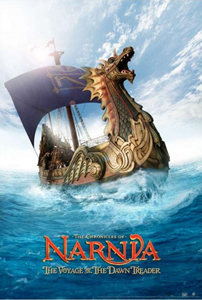 The Chronicles of Narnia: The Voyage of the Dawn Treader | personal.amy-wong.com - A Blog by Amy Wong. I liked the first one (my mom liked it a lot though, she caught it on tv and watched it through… she's never done that with any recent family films. must be the epic battles). However, I liked Caspian better… in terms of what was going on. I would have probably liked Lion better if the battle had a little more blood in it – I had the same issue with Golden Compass, which I rather liked (but still wanted the real ending, instead of the movie ending) – The bear battle almost blew me away except it didn't have any blood… even in that horrific part where Iorek takes Iofur's jaw. C.S. Lewis & J.R.R. Tolkien & E.B. White & Roald Dahl own J.K. Rowling. Ok, not quite relevant to this post, but I'm just saying. I enjoyed the first Narnia movie well enough, but not enough to run out to the second one. I've heard some terrible things about this one, though you make it sound watchable at least. Surely it has to be better than Legend of the Guardians: The Owls of Ga'Hoole. I lasted about 15 minutes into that one and had to check out. Total snooze. The secret is: low expectations, Craig. It's watchable. Ga'Hoole looked horrible – my main issue with the Satellites is that they had to fill the quota and nominated that in animation. If they don't like it, they shouldn't just nominated it to fill in the blank space. And… I dunno who E.B. White is xD I'm not gonna google and pretend I know. ;P So who's he? E.B. White wrote some great kids books including Charlotte's Web and Stuart Little. Cornerstones of my childhood!